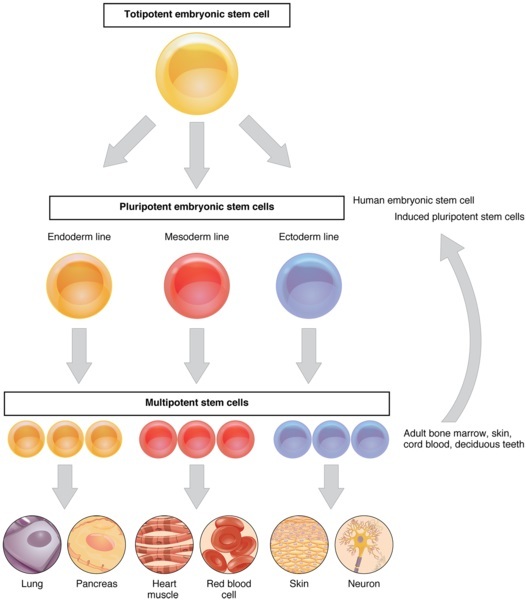 The main difference between embryonic and somatic stem cells is that the embryonic stem cells are pluripotent whereas the somatic stem cells are multipotent. That means; the embryonic stem cells can become all types of cells in the body while somatic stem cells can differentiate into several types of cells, but not all. Embryonic and somatic stem cells are two types of stem cells that occur during the lifetime of animals. Furthermore, embryonic stem cells occur in the inner cell mass of the embryo while somatic stem cells occur in most of the organs of the body including bone marrow, skin, skeletal muscles, liver, etc. Embryonic stem cells are the cells in the early stages of the embryo. The zygote, which is the conceptus of fertilization, divides by mitosis, forming the morula. After 5-6 days of fertilization, the morula develops into the blastocyst that contains two parts; the trophoblast and the inner cell mass. The trophoblast is the outer layer of the embryo, which contains cells that develop into the placenta and umbilical cord. Here, the cells in the inner cell mass are pluripotent and are capable of differentiating into any type of cells in the body. Moreover, they differentiate into the cells in the three germ layers; ectoderm, endoderm, and mesoderm. The cells in the three germ layers are multipotent stem cells that can differentiate into a particular group of cells in our body. Therefore, the cells in the ectoderm differentiate into the epidermis, lens of the eye, sebaceous glands, hair, nails, tooth enamel, etc. In addition, the cells in mesoderm differentiate into muscle, bones, connective tissue, cartilage, adipose tissue, circulatory and the lymphatic system, dermis, notochord, etc. Furthermore, the cells in the endoderm differentiate into the stomach, colon, liver, bladder, pancreas, lungs, etc. 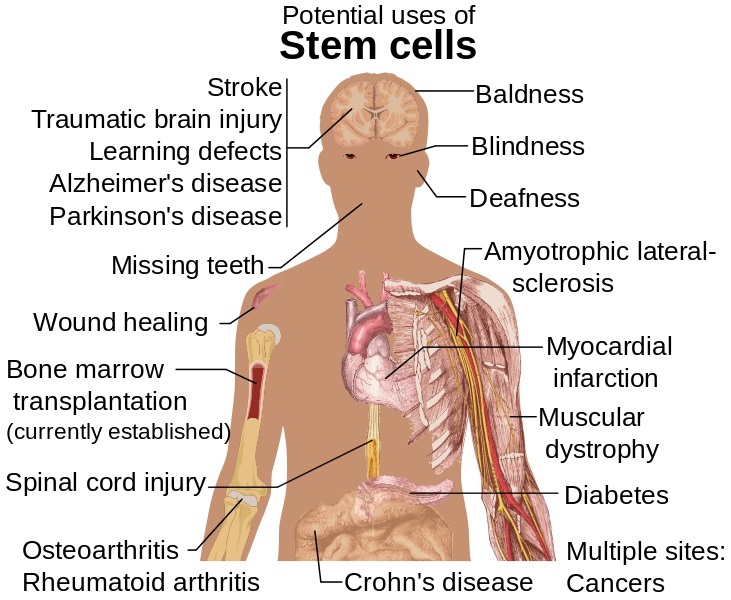 Somatic stem cells are the adult stem cells that occur inside the specialized tissues including bone marrow, skin, skeletal muscles, brain, liver, pancreas, dental pulp, etc. Furthermore, these cells are multipotent and can only differentiate into the several types of functionally-related cells that belong to the tissue of origin of the stem cells. Therefore, they continuously divide to produce new cells. A part of these new cells differentiates into the functionally-specialized cells in that tissue and the rest of the cells renew the existing stem cell population. For example, dividing hematopoietic stem cells in the bone marrow differentiate into the cells in the blood including red blood cells, white blood cells, and platelets. In addition, the stem cells in the bone marrow are the most studied type of somatic stem cells in the human body. However, somatic stem cells are difficult to identify, purify, and grow in cultures. Therefore, these stem cells are rarely subjected to the studies. Embryonic and somatic stem cells are two types of stem cells that occur in the different stages of the life cycle of animals. Both types of stem cells are capable of self-renewing and differentiating into functional cell types. Embryonic stem cells refer to the stem cells derived from the undifferentiated inner mass cells of a human embryo while somatic stem cells refer to the undifferentiated cells found throughout the body that divide to replenish dying cells and regenerate damaged tissues. 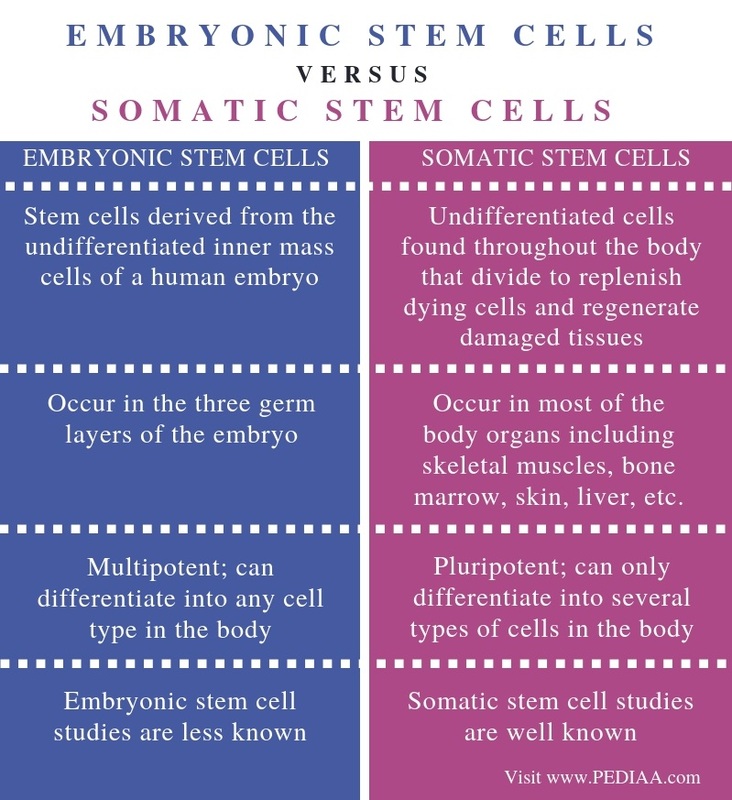 This is the basic difference between embryonic and somatic stem cells. Embryonic stem cells occur in the three germ layers of the embryo while somatic stem cells occur in most of the body organs including skeletal muscles, bone marrow, skin, liver, etc. Potency is the main difference between embryonic and somatic stem cells. Embryonic stem cells are multipotent. That is; they can differentiate into any cell type in the body. In contrast, somatic stem cells are pluripotent. That is; they can differentiate only into several types of cells in the body, but not all types. Embryonic stem cell studies are less known while somatic stem cell studies are well known. This is another difference between embryonic and somatic stem cells. Embryonic stem cells are the stem cells in the inner cell mass of the embryo. Moreover, these cells are multipotent and they can differentiate into any type of cells in the body. On the other hand, somatic stem cells are the stem cells in the adult body organs. These cells can only differentiate into several types of cells in that organ, helping to replenish the damaged or aged cells. Therefore, the main difference between embryonic and somatic stem cells is the potency.